There are many reasons one decides to do a yoga and meditation retreat: you might feel like your stress level has been too high for too long and cannot cope anymore. You might be a regular yoga practitioner and want to be in a quiet place with more classes every day and the time to do only that. You might be in the midst of a life changing experience such as a breakup or a job shift. In my case, I believe the three reasons were valid, plus another one: I live in Norway where winters are long and dark. I needed to see the sun but wanted more than just sitting on a beach drinking a cocktail. I wanted to feel quiet in my mind and not just on the balcony of my hotel room. I think the most important element of a retreat is to have low expectations, and to be motivated. I was exhausted when I got there, but I wanted to feel better. You cannot expect to become a yogi master after a week, or master the Buddha’s meditation technique and have gotten rid of anxiety, anger, stress, depression, or whatever your poison is. However, I returned calmer, more focused, with a lighter body and the foundations to have a healthier life. My sleep had gotten much better, I made a stock of Vitamin D with the sun, and my clean diet at the retreat made me feel really good. This retreat I am reviewing is in Andalucia in South of Spain. The minimum stay is of 5 nights (I stayed 6 and I suggest you do too). Although it would be great to feel good after only a week end, it takes time to get into the rhythm, get rid of some toxins and actually get something good out of it. So yes, take a week off and go there. The retreat is made of two different houses which are built in the traditional Andalusian style and have a high standard as this used to be a luxury hotel. It is located in the middle of what seems endless fields of olive trees. 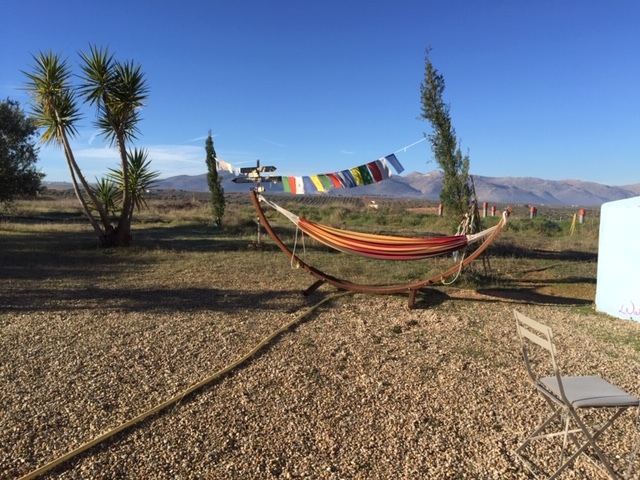 You are in the country side, can hear the birds when you wake up, and during the day there is a magnificent view on the Sierra Nevada mountain chain. The rooms are very comfortable, heated in the winter and cool in the summer. The one building is the place where all the rooms are, as well as the meditation room, whilst the second building is the kitchen, the living room and the place to eat all meals. 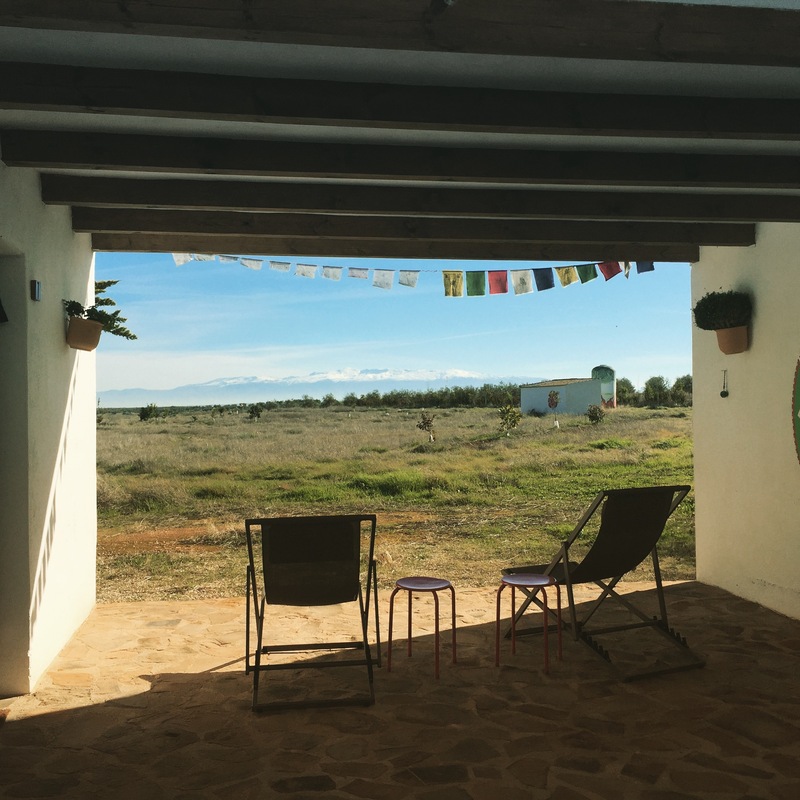 When you aren’t in the meditation or yoga classes (two of each per day), there are spaces to lie down, read, play ping pong, take a dip in the swimming pool or simply sit and look at the Sierra Nevada, mountains of Andalusia. In other words, if you leave your phone on plane mode, there is everything here to calm your mind and get you to unwind. Every day one needs to be ready at 06.55 maximum in the meditation room. That sounds rough, but you know what, just try the first day and see how it goes. One gets used to waking up early after a good night sleep and no noise outside, healthy food and no computers, believe me. Meditation is optional in this retreat, and on my first day I decided to give it a try. I spent the whole hour feeling pain in my legs and itches on my nose. Thoughts were speeding through my mind as Loïc was asking us to calm down and focus on our breath and think of nothing. Easier said than done! After this first hour I decided this was not for me, and felt very happy meditation was optional. You can imagine how surprised I was when I saw myself waking up the next day without an alarm clock at 6.30 am, waiting to go to meditation. I managed slightly better the second day, but not that much better. Somehow although it is hard to sit there and focus on very specific parts of your body, it also has an effect on your brain. The technique is called Vipassana and is the only technique we know from Buddha, who tried many different techniques before finding out this one is the best one. Loïc will tell you this is the best and only one, which you can decide on your own, but in any case trying it out twice a day for a week is an experience worth making. There is one hour of meditation every morning and one every afternoon. They also have young yoga teachers coming over to teach, which makes a very good variation in the teaching style and positions (or Asanas) they ask you to do. Yoga is much harder than one people think, and it is not just about stretching. In this case (for me) is about cleansing yourself with breath and with postures which relieve tensions in many organs we don’t take care much in our busy lives: kidneys, liver, heart, shoulders, sacrum etc. The teachers follow your level, and you are not forced to do any pose you aren’t comfortable with. By the end of the retreat I was able to do a head stand! I have to admit that I was very seduced by the idea of a retreat where other people cook for me three times a day healthy food. And this is exactly what happened, except that the quality of the food was beyond my expectations. The hosts Loïc and Francesca make all the food themselves. It is all vegetarian, and some meals are vegan but you will hardly notice if this is scary for you. There are lots of vegetables and fruits and sometimes treats like pancakes, pizza and chocolate mousse. Who said vegetarian food was boring? However my body got a little shock as there is no alcohol, coffee or tea and no sugar (except the one in fruits). I had a headache for 48 hours because of the lack of caffeine in my system but guess what, I survived, and I have not touched a cup of coffee since then (although this was not my aim at all. I was drinking about 4-5 cups per day). There is herbal tea and water available at all times though, and in the morning you will get energising beetroot or carrot and ginger shots freshly pressed. They make different recipes every day, and it is fresh, local, organic, and mostly from their own garden or from a local cooperative they buy from. When leaving I had a feeling I had given a little vacation to my liver and basically my whole digesting system. Trying to make it last by continuing this treat (let’s see how long that lasts). Before choosing this retreat I was online checking out all sorts of things. There are thousands and thousands of retreats out there and it is really hard to figure out which one to choose. It is not like on has endless holidays and can “waste” one week of those on a retreat which is not worth it. At Casa Bhakti you are in Europe, so no stress with getting clean water and boiling all the vegetables like a retreat in India for example. It is also closeby and accessible by plane (at Granada airport or Malaga airport), and more importantly the retreat including sleeping in a high standard room, getting three meals a day of good quality food, two yoga classes per day and two meditation courses per day is basically the price of a good hotel in a capital city without anything else than a bed with clean sheets. Needless to say the value is amazing. I found retreats at the same price per night in Sri Lanka for example. Of course this is very variable and unpredictable. But in any case it is lighter and warmer in Andalusia than in Norway or most parts of Northern Europe. In December we got quite high temperatures, meaning I was in my t-shirt during the day time (sometimes up to 24 degrees) and at night it was more chilly. With one of the other participants, who is British, we concluded with our sunglasses on after a nice lunch that this was the weather for a good summer day in the UK or Norway. It does get cold at night though (in the winter), but all rooms have heaters. There are quite a few hours to kill between the last yoga class of the morning and the first meditation class of the evening, but that is precisely time to take it easy, sleep, bathe or read. From March it is basically summer in the sense that you want to bathe to cool down your body. Same in September-October, and during July August they close due to high temperatures. Basically I would recommend to go there anytime of the year for the weather. I coupled this trip with a visit of Granada and the Alhambra. Do it if you have time! Otherwise going in and out of the airport for the retreat is also fine if you have only one week off. Here is their website: Casa Bhakti – Do not hesitate to contact them with questions, they usually reply quite fast. 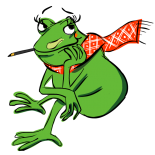 If you go there, say Hi from the Norwegian Frog! Disclaimer: I have not received any payment from anyone to publish this review, and everything I wrote is a genuine review of my experience. Thank you for tour great post! 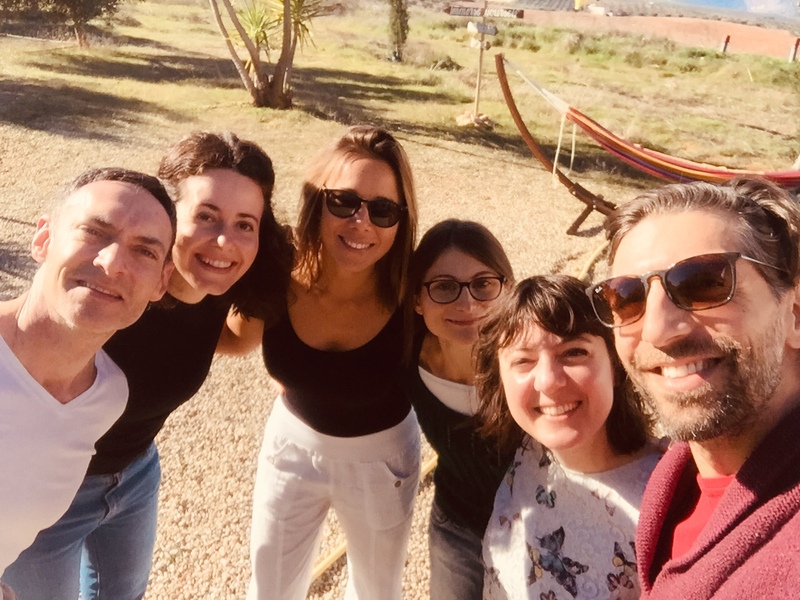 I am a “malacitana” (from Málaga) woman that love yoga and I’ve enjoyed with your clear and pasionate description of the retreit and the wonderful place!! I’ll try yo visit them un the future! I’ve been really trying to get into this, I’m from Norway by the way, and it just hasn’t been going very well for me. I even tried a sort of retreat, and I didn’t like it at all. First of all it was very overpriced in my opinion. The food was not good at all. For someone who is allergic to nuts it’s very hard to find decent vegetarian food, and some unidentifiable red soup with tofu dices is not very appealing to me at all, I had to force myself to eat it so I wouldn’t starve, you have no idea how good MacDonald’s smell after that . The meditation and yoga stuff I was fine with, but this one had a bunch of other things too that I didn’t like at all, or only liked parts of. The rooms where also shared, which I didn’t expect considering the high price. For me there is no possible way to get a good nights sleep if I’m sharing the room with strangers. The people seemed nice enough, but some things gave me the feeling of being indoctrinated into some cult. I’ve been thinking about giving a retreat another try, maybe it would be different in a place like this, but that whole experience gave me a really bad taste. It’s going to be a while before I can afford doing something like that again anyway, and part of me is thinking that a beach with cocktails would just be a much better use of my limited income. It was kind of funny that I read this post today. Yesterday I got a call form my doctor who said I had vitamin-D deficiency and he had made me a prescription that I forgot about until I just read your post, so thanks for that. Norway seem the country where everyone wants to escape and go somewhere else to feel better because there are long and dark winter, there is not a lot of sun. In my opinion the truth is: it’s not the weather, it’s how people behave with each other that causes Norway to be a wonderful place with a population who wants to leave (because it happens also in summer). I really believe Norwegians should really build again the sense of community of values, love, true kindness and make people realize that deep happiness is found where you belong to a community and you need to stay there, living there because abroad you would miss the small things that makes that place so special in your heart. Losing the sense of community will have deeper effect that can’t be fixed easily. I hope these words make sense and give a different perspective to how I think Norway is. Winter is just a season, he is really a kind cold man hugging you in a cozy house. Hi Andrea, have you lived in Norway before? Yes, for two days then I went back to a different country. The mistake is that you think what I wrote before was about my feelings. Probably because it’s bad to express feelings in Norway between people so you don’t know what they are feeling.